Fully Tailored Car Mats for your Alfa Romeo 33 Car Covers. Guaranteed fit! Alfa Approved Fixings. Manufacturers Warranty. 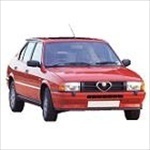 Custom tailor made car cover for the Alfa Romeo 33 hatchback from 1983 to 1994. This cover comes in its own handy case and fully tailor made including door mirror pockets.